VietNamNet Bridge - Drought and saltwater intrusion are affecting the Mekong Delta earlier than usual. The latest report from the Southern Institute of Water Resources Research said that the water level measured at Prek Kdam station, near Tonle Sap, at the beginning of the 2018-2019 dry season was much lower than previous years, warning of early drought and saltwater intrusion. Tonle Sap’s capacity in the 2018 flood peak period was higher than in recent years. However, as the flood weakened early, the water level of the lake went down rapidly. By the end of January 2019, the water level in Tonle Sap was 3.1 billion cubic meters lower than that of the same period of 2017. The figure was just 2.2 billion cubic meters higher than the 2016 historic drought. At present, the water capacity in Tonle Sap is low compared with the first days of the dry season (early November 2018). Therefore, scientists predict that the flow from Tonle Sap to Mekong Delta will be limited in the time to come. The institute’s forecast shows that the tide peak will come at the beginning and in the middle of every month. Meanwhile, the northeast monsoon (in the East Sea) occurs at the beginning of the dry season, thus increasing saltwater intrusion into the river and arroyo network in Mekong Delta. According to the National Center for Hydrometeorology, in the 2018-2019 dry season, the forecasted temperature in the Mekong Delta will be higher than the average temperature by 0.5-1 degrees Celsius, with the highest possible temperature at 33-37 degrees Celsius. From February 2019 to the end of the dry season, there is the possibility of unseasonal rains, but scientists believe that the rainy season in Mekong Delta is likely to come later than usual. With the predicted meteorological conditions, freshwater resources are likely to be scarce. In addition, high temperatures will intensify evaporation, leading to an increase in water demand for crops and livestock. 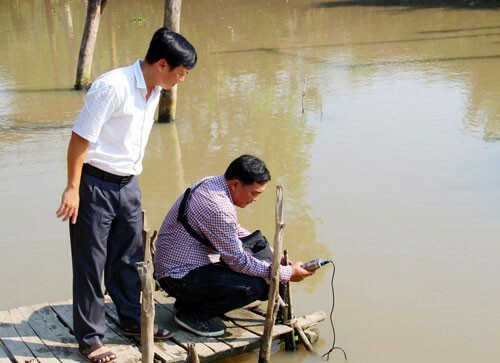 Pham Minh Truyen, deputy director of the Tra Vinh agriculture department, said saltwater had intruded into many places in the province. In the districts of Cang Long and Cau Ke, the salinity was measured at 2 percent, while the figure is higher in coastal areas, at 10-14 percent. In An Giang province, the water level in the rivers and canals is decreasing, now staying at 0.1-0.3 percent lower than the same period last year. Tran Anh Thu, deputy chair of An Giang People’s Committee, predicted that the locality would suffer from drought for two months, from the beginning of March to the end of April.